A Double ended bath, with really deep soaking position. Put your taps on the side or on the corner with a shower attachment for the best of both worlds. Add a spa system and enjoy. Thanks to Peter for sending in a picture of his newly installed Chagoi bath. Thanks to Sheri for sending these images and a video of her Chagoi. 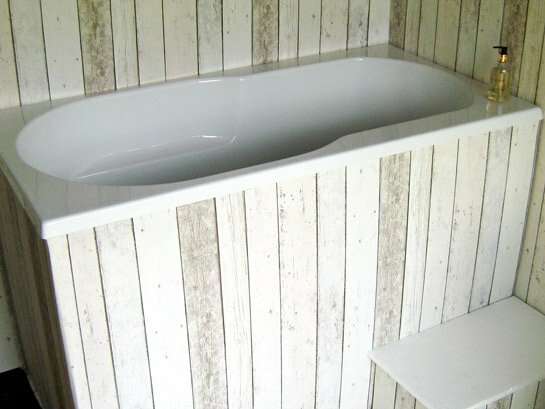 Thanks to Mrs Cresswell for sending in this picture of her Chagoi bath fitted with wood panelling. Alternatively you can download an order form and post your order to us here.